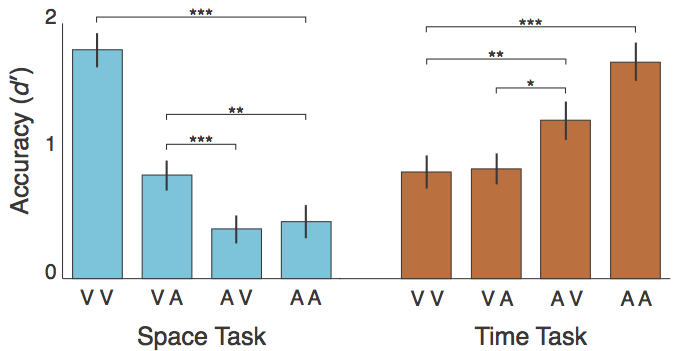 Working memory accuracy for spatial information (blue) is highest in a purely visual task (VV), while accuracy for temporal information (orange) is highest in a purely auditory task (AA). Adapted from Noyce et al. (2016), Attention, Perception, & Psychophysics. Different senses are not only specialized to detect environmental energy; the neural machinery that supports vision and audition is also specialized to perform certain kinds of computations. Visual input is intrinsically spatial, and vision has an affinity for spatial information; auditory input is one-dimensional over time, and audition has a corresponding affinity for temporal information. I perform behavioral experiments testing whether and how these affinities interact in working memory, and fMRI experiments investigating how sensory-biased cortical areas may be recruited for specific tasks. Noyce, A. L., Cestero, N., Michalka, S. W., Shinn-Cunningham, B. G., & Somers, D. C. (2017). Sensory-biased and multiple-demand processing in human lateral frontal cortex. Journal of Neuroscience, 37, 8755-8766. Noyce, A. L., Cestero, N., Shinn-Cunningham, B. G., & Somers, D. C. (2016). Short-term memory stores are organized by information domain. Attention, Perception, & Psychophsyics, 78, 960-970. Lynch, J.L., Shinn-Cunningham, B. G., Somers, D. C., & Noyce, A. L. (in prep). Work- ing memory capacity estimates are better predicted by task domain than by sensory modality. The neural response to a rarely-occurring distractor produces a negative electrical field over visual/posterior areas of the brain. This corresponds with a dramatic enhancement of the effect of the distractor, such that people are fastest and most accurate when the distractor matches the target (top green line), and slowest and least accurate when it is different (bottom green line). Adapted from Noyce & Sekuler (2014), Neuropsychologia. The human brain often works in a predictive, feedforward manner, recognizing a familiar context and anticipating upcoming events. I’m interested in how this learning happens (including what it means to “recognize a familiar context”), how anticipation supports cognition, and what happens when a novel, unexpected event occurs instead. I use behavioral studies and EEG/ERP techniques to determine the neural mechanisms that reflect this learning and expectation, and those that respond to deviant or unexpected events. Noyce, A. & Sekuler, R. (2014). Oddball distractors demand attention: Neural and behavioral responses to predictability in the flanker task. Neuropsychologia, 65, 18–24. Noyce, A. & Sekuler, R. (2014). Violations of newly-learned predictions elicit two distinct P3 components. Frontiers in Human Neuroscience, 8, 374. Maryott, J., Noyce, A., & Sekuler, R. (2011). Eye movements and imitation learning: Intentional disruption of expectation. Journal of Vision, 11(1:7), 1–16. Noyce, A. & Sekuler, R. (in preparation). Dynamic reallocation of VSTM resources.